The “before” questions inevitably go back to our own ancestors. For most of us, the recorded history is undiscoverable back to the beginning. We are just trying to find the path as far back as possible before it fades into obscurity. My name is at the bottom of what is described as a family tree. Two branches grow out of it – my mother and my father. Then the branches split into four – my maternal grandmother and grandfather – my paternal grandmother and grandfather. Then it splits again into 8. The recorded history of my “before” is not clear at this point. I wasn’t around then; I never knew them. My personal “before” has slipped into obscurity. The husband of my second cousin recently contacted me to ask if I had any information about the parents of my mother’s father, his wife’s great-grandfather. They were in the middle of their “before” question. (I have other cousins who have traced back their lineage, on my father’s side of the tree, to find out if they were truly related to a mysterious Cherokee Indian woman and a Civil War hero. Their DNA revealed “NO” to the Cherokee lady;“YES” to the brave soldier.) I was certain I had no information but agreed to look in my grandmother’s box of pictures. To my surprise, inside it were two Memorial books – one for my grandmother and one for my grandfather. On the second pages were the names of their parents and a list of their siblings. I was pleased with the find. Then it hit me. I just found the information about my own great-grandmother and great-grandfather – the “before” people I never remember hearing about. The Bible very clearly traces the “before” of a people whose progeny live today. There were 12 sons of Jacob, grandfather Isaac, and great-grandfather Abraham. Their “before” does not slip into obscurity. It goes all the way back to one of the three sons of Noah, and finally back to the third son of the first man Adam. Very clear. Very precise. Nothing obscure. “Before” is not hidden in darkness. They did not crawl out of pond scum on all fours. They came from the Word of Creator God, who wrote on his crown of creation the signature of His nature – His image. He preserved them to make a way to save them from themselves – the Way back to Him. When the first man and woman, Adam and Eve, chose to disobey God, sin marred all creation. Their choice to disobey the One who loved them brought death and separation and passed down to their children the propensity to make choices away from and apart from God. We are their descendents. 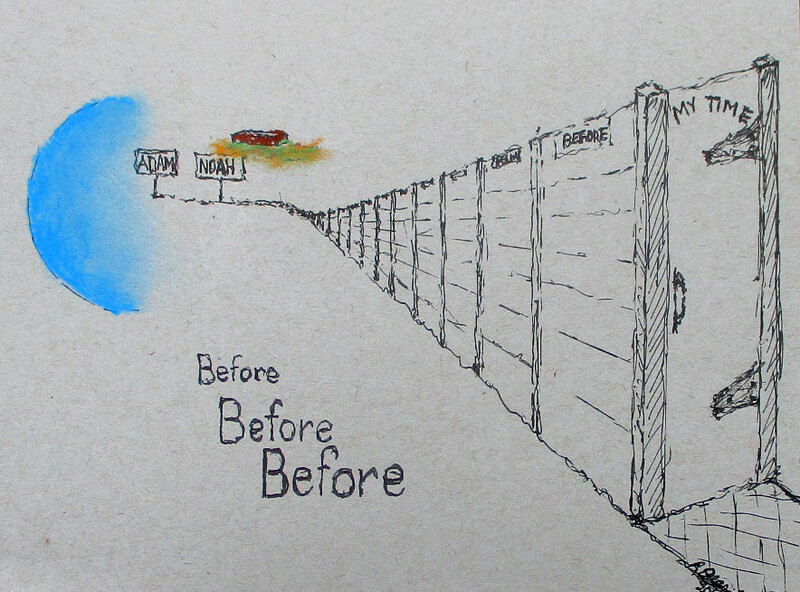 They are our “before.” If we were able to go back far enough, we would find we are all related to at least one of the children of Noah and ultimately back to Adam and Eve. It’s the very reason our world can sometimes be overcome with evil and suffering, and why we ourselves have the same inability to choose right over wrong without Him. Our mutual “before” leads us closer together, not further apart. Creator God, does not leave us there. There is no obscurity behind us – no darkness ahead. He is there. The One who made provision for our fallen nature from the beginning through the plan of salvation through His Son, the lamb slain before the foundation of the world, is the One who beckons us to come and talk to Him, reason with him, know Him, receive the life-giving spirit of the Last Adam, Jesus the Son of God. He is more than “before.” He is eternal God – who was, and is, and is to come. Tagged Bible, creation, family tree, genealogy, Genesis, lamb slain, Last Adam.